Today’s action by the Essex Regional Retirement Board to dismiss its current Chief Executive Officer marks a first and important sign of self-awareness that serious problems exist with the ERRB and that public confidence in it has been shattered. While the action that has been taken today is important, it has taken far too long for the board to move in the directions of reform, transparency and accountability. We must move forward to bring about the necessary reform that this situation demands, and I am confident that decisive action by the Senate on the ERRB is imminent and that the Northeast Legislative Caucus will be relentless in its pursuit of reform. An article about the Essex Regional Retirement Board by the Salem Daily News can be found by clicking the link (www.salemnews.com). Recently I have had the opportunity to learn about a tremendous new concept known as “The Helping Exchange,” which is also referred to as ThEX. This web-based system was created to connect those with a particular financial need with those who might like to assist them with that need. ThEX facilitates peer-to-peer giving and is remarkably efficient in that nearly 100% of a donated financial gift reaches the person who needs it. Administrative and operational expenses are minimal. Through this electronic medium those who are seeking to assist others can learn about the particular needs of someone in their community or someone from anywhere in the country or the world. You can learn more about ThEX by logging on to www.thehelpingexchange.com. I’m pictured below with the dedicated individuals from Manchester-by-the-Sea who developed ThEX and are working to enable it to reach its full potential. 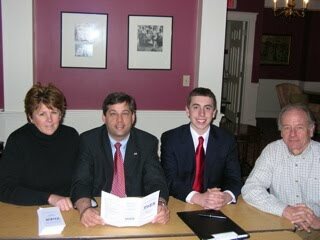 From left to right: Susan Coffin, ThEX Volunteer; Senator Bruce Tarr; Matt Hoyle,ThEX Intern; and Bill Shipman, Founder of the Helping Exchange. 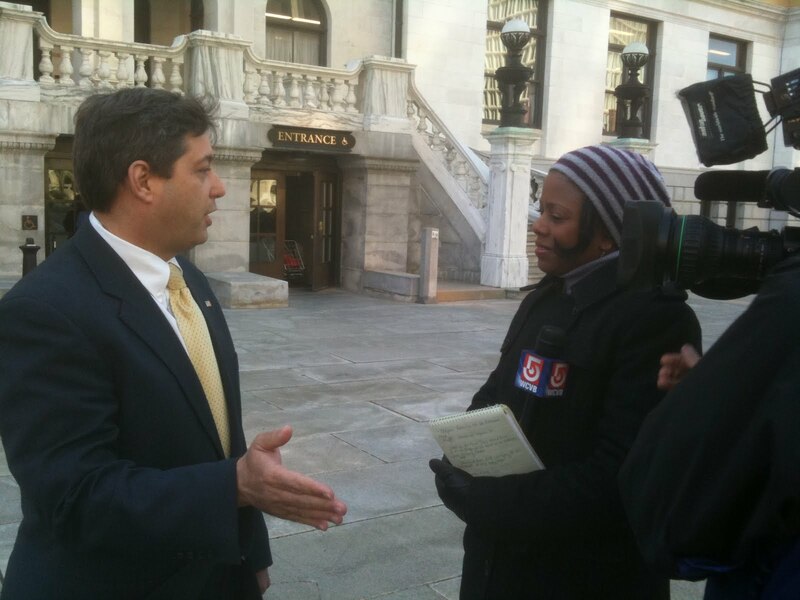 Today I had the opportunity to discuss needed reforms in the way our State repairs and replaces structurally deficient bridges with Rhondella Richardson of WCVB, Channel 5. You can watch her report by tuning in tonight at 11:00 pm. Two editorials in today’s newspapers make particularly important points about reform and bureaucracy. The first, from the Gloucester Daily Times, highlights the need for sweeping reform of the Essex Regional Retirement Board. A second piece in today’s Newportburyport Daily News, speaks to the value of teamwork and practicality when facing serious issues concerning the environment and public safety, such as those presented by erosion on Plum Island. The severe erosion that has occurred on Plum Island over the past several days has caused local and state officials to convene a technical meeting to evaluate options for stabilizing the area south of Island Center on Friday. Called for the purpose of exploring all available options to stabilize the dune system and protect several homes that are in jeopardy, the meeting will be open to the public and conducted at P.I.T.A. Hall at 2pm. The unexpected occurrence of erosion in this area of the beach and dune system clearly presents a major new challenge and we need to address that challenge with the team approach we have used to make so much progress thus far on the northern section of the island. On Friday, March 5, I was honored to join with Representative Brad Hill in Memorial Hall at the State House to recognize the remarkable efforts of Vietnam Veteran Michael Reagan, who is an accomplished portrait artist. He founded, and continues to build, the Fallen Heroes Project. Through the project he provides portraits of those who have given their lives in military service to their family members. You can read more about this important project at www.fallenheroesproject.org/. I co-sponsored a Joint Resolution with Representative Hill to recognize Mr. Reagan’s efforts, and today we presented it with the Chairs of the Veterans committee, Senator Ken Donnelly and Representative Harold Naughton and Secretary of Veteran’s Affairs Thomas Kelly. We presented it to Marine Staff Sergeant Coffey, a distinguished young man who resides in Plymouth and is considered by Mr. Regan as like a son. Today the Senate debated H.4516, “An Act Providing for the Financial Stability of the City of Lawrence”, which would, among other things, authorize $35 million in borrowing to address the growing fiscal crisis in that city. While the main bill would allow this borrowing subject to the scrutiny of an “overseer”, an amendment I co-sponsored with Senators Tisei, Knapik and Hedlund would provide the strong financial controls of a Fiscal Control Board. Unfortunately our amendment was defeated by a vote of 7-28. A second amendment, offered by Senator Panagiotakos (the Chairman of the Senate Committee on Ways and Means), provides for the possibility of a receiver if the situation worsens. That amendment passed by a unanimous vote of 35-0. 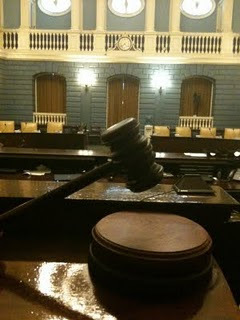 Despite some modest improvements over the bill originally filed by Governor Patrick to address the issues facing Lawrence, the final bill considered by the Senate today is deficient in two major ways: 1) the bill lacks a strong fiscal control board and 2) borrowing could occur prior to a determination by such a board that it is fiscally prudent. Accordingly, I voted against the bill. To view how all of the members of the Senate voted on the bill and the amendments referenced, please click on “Read more” below. Please tune in to “Broadside” tonight at 6:00pm on New England Cable News (NECN). I’ll be discussing Congressman Delahunt’s decision not to run for re-election and what that means for the State Republican Party, Governor Romney’s potential presidential run, and President Obama’s deadline to Congress for action on health care reform with host Jim Braude and Representative William Straus. Tuesday I was able to amend the safe driving bill passed by the Senate to include a powerful new tool for prosecutors to punish those who endanger our lives by reckless driving. My amendment creates a new crime, with a penalty of up to 10 years in prison. Please click on “Read more” to read a press release about this amendment. Boston- State Senate Assistant Minority Leader Bruce Tarr (R-Gloucester) has placed an amendment into the Safe Driving Bill approved on Tuesday by the Senate that would give prosecutors a powerful new tool to punish those who drive recklessly on the state’s roadways and cause a death. -one for those who drive negligently or recklessly and cause a death while under the influence of alcohol or drugs. The penalty for this category is 2.5-15 years in prison and /or a $5,000 fine. -a second for negligent operations resulting in death, carrying a punishment of 30 days to 2.5 years in prison and/or a $3,000 fine. Tarr’s amendment recognizes the greater degree of danger, and criminal responsibility of, those who are not merely negligent, but who evidence a disregard for safety in such ways as excessive speeding that results in death. The new category of crime for reckless driving that causes a death would be punishable by up to 10 years in prison and/or a $3,000 fine. “Often we read news accounts of tragic accidents and loss of life caused by extreme behavior, and are shocked at how minimal the penalties are for that behavior. Through the passage of this amendment, the Senate has taken action to ensure that the penalty fits the crime,” said Tarr. Since the House and Senate have passed different versions of the safe driving bill, it will likely proceed to a conference committee charged with reconciling those differences. 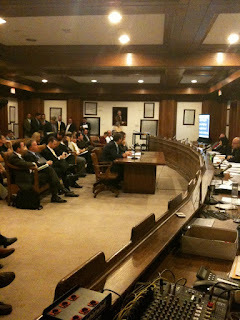 Tarr thanked Senators Steven Baddour (D-Methuen), Senate Chair of the Joint Committee on Transportation and Steven Panagiotakos (D-Lowell), Chairman of the Senate Ways and Means Committee, and Senate President Therese Murray (D-Plymouth) for their assistance in securing the passage of the amendment. Recently there have been widespread and serious allegations of improper acts by the Essex Regional Retirement Board. These allegations, from such sources as the Public Employee Retirement Administration Commission (PERAC) and the Essex District Attorney, compel action to reform the board. Working with the members of the Northeast Legislative Caucus, which I co-chair, as well as town officials from throughout the region, I developed reform legislation which was filed today with the co-sponsorship of other members of the House and Senate from both parties. A press release which summarizes the bill is posted in the Read more section below. Boston- Taking strong action in response to many serious allegations of improper acts by the Essex Regional Retirement Board, State Senate Assistant Minority Leader Bruce Tarr (R-Gloucester) and many members of the legislature’s Northeast Legislative Caucus have filed legislation to reform the operations of the board to ensure the it operates with accountability, transparency and respect for the law. Tarr authored the bill over the past several weeks. A key component of the bill is the requirement that the Public Employee Retirement Administration Commission (PERAC) appoint a receiver to oversee and direct the operations of the board. The bill is co-sponsored by Senator Thomas McGee ( D-Lynn), and Representative Robert Fennell (D-Lynn), who chair the caucus with Tarr, and Senators Susan Tucker (D-Andover), Steven Baddour (D-Methuen), and Fred Berry (D-Peabody), and Representatives Brad Hill (R-Ipswich), Mary Grant (D-Beverly), Harriet Stanley (D-West Newbury), Brad Jones (R-North Reading), Ann-Margaret Ferrante (D-Gloucester), Ted Speliotis (D-Danvers), John Keenan (D-Salem) and Lori Ehrlich (D-Marblehead). “Today we are taking a critical step toward restoring the integrity and stability of a retirement system which needs reform. Thousands of public employees are depending on it for their future; they and the taxpayers who are contributing to its operations deserve the transparency and accountability that it has been lacking,” said Tarr. 1. To exercise any function or power of the board or its employees. 2. To appoint or remove any employee of the board. 3. To remove for cause any member of the board with 30 days’ notice. The dismissed board member can appeal the receiver’s decision to PERAC. Any seat vacated in this manner will be filled by election. 4. To subpoena from the board or system any documents relevant to the receiver’s administration of the system. 5. To promulgate rules and regulations for the board. 6. To alter or rescind any decision by the board or its employees within 14 days. 7. To oversee and discharge all other duties of the board, with the authority to delegate any of these powers and duties as the receiver sees fit. When the receiver leaves the position, all board seats will be vacated and new elections will be held. Current board members, as well as members removed by the receiver, will be allowed to be candidates in the following elections, but the receiver will not be eligible for the board. 1. Prohibit the chief executive officer from also serving as the chairman of the board. 2. Require that the first member of the board be a chief executive officer of one of the member towns, units, or districts of the retirement system, and elected by those member towns, units, or districts by a vote weighted by the number of members in the retirement system. 3. Provide that the chairman will be elected from among the members of the board. 4. Ban all members and employees of the board from serving as lobbyists. 5. Give the ERRB advisory council, made up of the treasurers of all the member towns, units, and districts, the power to approve the expense and administration budget of the retirement system. “It is our hope that by allowing PERAC to appoint a receiver to administer and direct the Essex Regional Retirement Board, that proper sensible management will be re-established,” said Representative Fennell. The reform bill reflects the collective input of caucus members, who developed consensus around the pressing need for reform over the past several weeks. The legislators were assisted in the process by municipal officials from throughout the region. The bill, which contains an emergency preamble allowing it to take effect immediately upon its passage, was filed with the clerk of the Senate today at 5:00pm. Two important amendments were passed by the Senate in debate today, and are now part of a safe driving bill (S. 2290) which itself was passed by the Senate on a unanimous voice vote. The first, which I co-sponsored with Senators Tisei, Knapik, and Hedlund, places into state law a prohibition on illegal or undocumented aliens being able to apply for a Massachusetts driver's license. The second, which I authored and sponsored, would create a new category of motor vehicular homicide. This will give prosecutors a new tool to charge and punish those who drive recklessly and cause a death, with new penalties ranging from 2 1/2 to 10 years in prison. Please watch New England Cable News network tonight to see my interview with reporter Scot Yount regarding the safe driving bill which passed the Senate today. Yesterday I had the opportunity to visit sites that experienced damage in last week’s storm with Governor Patrick, State Representative Ferrante, Gloucester Mayor Carolyn Kirk and representatives of the Executive Office of Public Safety and National Grid. We are working together to address the needs created by extensive damage, primarily due to wind, in our region. Given the scope and magnitude of damage caused primarily by wind in the storm that occurred last week, state officials are working to develop damage assessments (including operational costs such as labor) that could create eligibility for federal disaster assistance. 1. The Massachusetts Emergency Management Agency (MEMA) is beginning the process of collecting damage assessments for public property (i.e. costs borne by cities and towns). That process will be coordinated through local emergency management coordinators at the municipal level, who will be receiving guidance from MEMA on this subject. This information will be used initially to determine if eligibility thresholds are met so that the state can make a request to the federal government. 2. MEMA will next be seeking to ascertain whether or not eligibility thresholds have been met for private, uninsured property damage. Guidance will be forthcoming on the process by which assessments of private damage will be collected. A critical task common to establishing eligibility, for and receiving, financial assistance is the documentation of all damage that has occurred and all costs that have been incurred as a result of the storm. Photographs, drawings, narrative notes, receipts, cost estimates and other similar elements of documentation should be procured and retained. I remain committed to working with local, state and federal officials to explore every avenue for assistance, and to ensure that losses are properly compensated should federal assistance become available. Municipal questions relative to the disaster assistance process should be directed to MEMA at (508) 820-2000. Should you need further assistance, please do not hesitate to contact Cynthia Lewis in my office at (617) 722-1600. 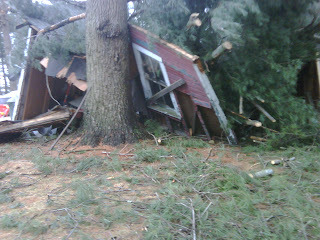 The below photos were provided by Representative Ann-Margaret Ferrante and Gloucester City Councilor Paul McGeary. Tomorrow the Senate will be taking up S.2290, which addresses safe driving. The Senate Republican Caucus has filed two amendments which deal with those who are not legally present in our country and operate a motor vehicle (clerk’s amendment #6), and those who produce, distribute, or utilize false identification cards (clerk’s amendment #26). You can read the bill itself here, and the amendments here. Maintaining the integrity of the laws of our state is important, and we will pursue these amendments vigorously in tomorrow’s debate. Over the years Jim has worked tirelessly to support the sport of dory racing, and to involve more and more participants in events in the United States and Canada. He has inspired many people with his charismatic personality and sense of humor. I have known Jim for many, many years and am convinced he would be a great ambassador for our region and our state on this popular series. Please join me in voting for him by clicking here.